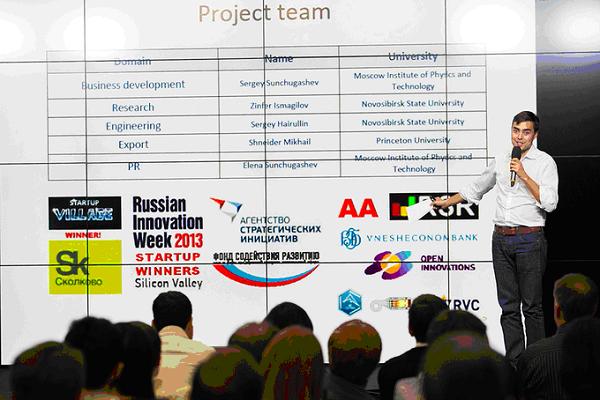 Yesterday’s Challenge Cup in Moscow brought out some amazing startups and an engaged crowd. The room was on edge as the judges announced the winners at Digital October. 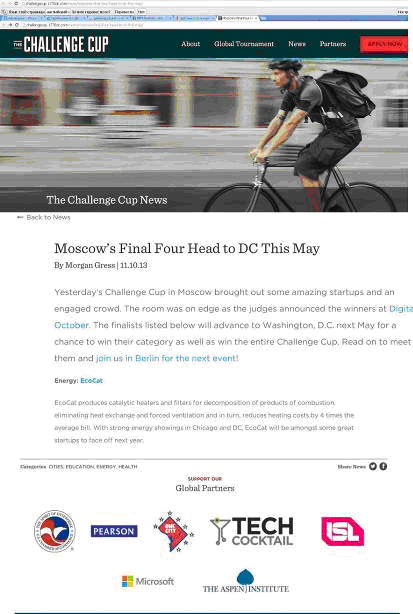 The finalists listed below will advance to Washington, D.C. next May for a chance to win their category as well as win the entire Challenge Cup. Read on to meet them and join us in Berlin for the next event! EcoCat produces catalytic heaters and filters for decomposition of products of combustion, eliminating heat exchange and forced ventilation and in turn, reduces heating costs by 4 times the average bill. With strong energy showings in Chicago and DC, EcoCat will be amongst some great startups to face off next year. 5 -дневная программа, включающая семинары и совещания с руководителями , корпоративных партнеров, инвесторов и предпринимателей. СМИ: интервью и продвижение через глобальные каналы СМИ. пропуск на 1776 Campus для коворкинга, встреч и общение со стартапами со всего мира. Возможность встретиться с руководителями , инвесторами и предпринимателями. Международная премия: $ 650 000 призовых денег. Каждый победитель получит приз $ 150 000 в виде инвестиций от «1776dc.com». REGIONAL WINNERS: will win travel expenses and a hotel for a week-long trip to Washington, D.C. for the final tournament. MENTORSHIP: Opportunity to meet with executives, investors, and entrepreneurs. EXPOSURE: significant PR & marketing, a dedicated 1776 writer covering the events, and distribution through global media channels. COMMUNITY: build ties with growing startups in your region. TRAVEL: regional competition winners will receive an expense-paid 1-week trip to Washington, DC for the Global Finals in May 2014. REGIONAL PRIZE: regional competition winners will receive a 1776 virtual membership until May 2014 that provides support from 1776 mentors, advisers, and programming. THE TOP 8 FINAL TOURNAMENT WINNERS: will win an investment from 1776. MENTORSHIP: 5-day program including workshops and meetings with executives, corporate partners, investors, and entrepreneurs. EXPOSURE: significant PR & marketing, a dedicated 1776 writer covering the events, coverage though media partners, and distribution through global media channels. MEDIA DAY: interviews and introduction to the top reporters in each industry. An all-access pass to 1776 Campus during the Global Finals week in May 2014 for coworking, meetings, and community. COMMUNITY: build ties with growing startups from around the world. GLOBAL PRIZE: $650,000 in total prizes. 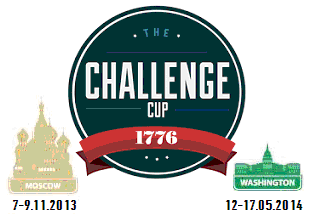 The Challenge Cup overall winner will receive a $150,000 prize. All prizes come in the form of an investment from 1776.